Please get it directly from www.radicalhonesty.com or from your local on- or offline bookstore. Radical Parenting brings together the revolutionary ideas in psychotherapist Brad Blanton’s other books – Radical Honesty, Practicing Radical Honesty and Honest to God (with Neale Donald Walsch). The honesty and openness of the author himself about his own children is combined with the wisdom gleaned from years of work with people suffering from how they were raised. This book does no less than create an entirely new blueprint for parenting. It’s for people who really want to transcend the limitations of the family and culture in which they were raised. It is based on decades of work with thousands of individuals and families, as well as the most recent scientific research on brain physiology, biochemistry, cognitive theory, evolutionary theory, cultural anthropology, and psychological growth and development. The goal of this book is to show parents how to parent consciously, so they can prevent crippling their children in the same ways they were crippled in their own families and schools. It goes into intricate detail about how human minds get built, how they function, and how they malfunction. It gives practical examples of what to attend to with children from the beginning of their life, and how to be with them as they grow. And it rants eloquently against the cultural limitations that make us blind to how we re-create suffering, so we can nurture our children in a way that allows them to remain playful and curious all the way into adulthood. 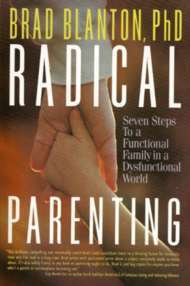 "Unfortunately, no books like Radical Parenting were available when I was raising kids, or I would have been a better parent. Oh sure, I THOUGHT I was a good parent. And, if you think you're a good parent, then you need to read this book, too. Because all parents abuse their children in one way or another. But, the worst kind of abuse is often the abuse that you aren't even aware of. This newest book by Dr. Brad Blanton gets REAL about the major sins we commit as parents using our children as the victims. It tells how we fail to maximize the opportunities for our kids to grow and develop into creators and become happy people. It shows the way to raising radically better kids by focusing first on our own growth and inner development. This book points out the traps and barriers set up for parents by our culture, our politics, our religion and, of course, the mind. It tells what makes people happy and what makes them be in love and become loving people. It reveals how children and grown-up's achieve satisfaction and fulfillment in life. There are wet marks on the pages where I learned some of the dumb things I did. I understand myself better as a result of this book. And, I also know better how to learn from children. Thanks, Dr. B. for this GREAT BOOK!" "In some ways this is my favorite of this author's books. Much more is addressed than parenting, so if you are not a parent the book is still relevant. One central issue, as in his other books, is the war between being and the mind. Here, Blanton explains how a mind gets built, how it functions and how it malfunctions, and further, how we might bring about the balanced use of the mind, while remaining centered in the experience of the body. But don't think the book reads as theoretically as this explanation sounds. Blanton always writes from his heart in his inimitable style that is always fun to read. In this book he draws on his own experience in parenting (beginning with his younger brother when Blanton was nine). The short version: All you have to do is grow up and at the same time never get over being a child." "My favorite parenting book . . . and I've read a lot of them. A no-nonsense guide to raising healthy, happy, honest, self-reliant children who love and respect themselves and those around them."